This is a delightful, refreshing sweet! It's also very light and is often accompanied by ice cream. You will need kataifi phyllo and mastic to make it - if it is difficult for you to obtain where you live, then there are a couple of links at the bottom of this post where you can order them on the internet. You will then need to crush the mastic drops. Melt the butter and spread evenly over the phyllo with a spoon. Put in a pre heated oven at 180 degrees Celsius for 30 minutes or until it is golden brown. Just before the 30 minutes is over, prepare the syrup by boiling the water, sugar and lemon juice for 4 minutes. Remove the phyllo from the oven and pour the hot syrup evenly over it. Set aside to cool and absorb the syrup. Heat ¾ of the milk in a pan. While the milk in the pan is heating, but before it has come to the boil, dissolve the corn flour and sugar in the remaining ¼ of the milk. Add this slowly to the milk in the pan, stirring continuously. Bring to the boil and once it thickens, remove from the heat. As soon as it cools, add 250ml of the whipping cream, stirring very well. 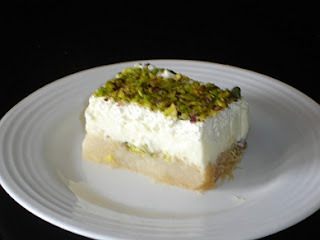 Sprinkle half of the crumbled pistachio nuts over the kataifi phyllo. Spread the cream mixture on top of this. Set aside to become completely cold. Whip the remaining cream with the icing sugar. Spread this on top and even out the surface. Sprinkle the remaining crumbled pistachio nuts evenly on top. Put in the fridge for at least two hours. Yes, Canadian Doomer, It's really delicious - especially served with ice cream! Mastic is exported, but you can also get it on the internet - see the link at the bottom of the post. Kataifi phyllo is also exported, but you can also get it on the internet - see the other link at the bottom of the post. You should be able to get corn flour. If you can't find vanilla corn flour, then just use plain and use a capsule of vanilla, as mentioned in the recipes. Thanks @tea with hazel! There was indeed an error with the corn flour - it should read 250g and we've now corrected it. However, the milk is listed in the ingredients - perhaps you missed it. Many thanks, once again, and good luck! thanks so much for corn flour correction..